The following text is a rewritten version of the monologue which was broadcast in the shopping centre ‘De Kalvertoren’ in Amsterdam on 27 April 2005 between 4.45 pm and 5.45 pm in the programme of the art project Radiodays at The Curatorial Training Programme of Foundation De Appel in Amsterdam. Several ghetto blasters hidden in plastic bags received the broadcast voice. The voice was dispersed over the homogeneous pedestrian zone. The titles should not be read. New lines and spaces indicate pauses. Ghetto blasters, hidden in plastic bags, broadcast the monologue by LIGNA. Hi, you do not know me, but I am talking to you. You don’t see me. But I am here. Not only here. But here and there. And here. Sorry, I didn’t introduce myself. I am a solitary voice. We will never meet, but I will talk and you can listen, if you want to. I will tell you something about me. I will tell you some stories. I will propose some gestures. And, funnily enough, I will tell you something about the future of radio art. I’m a voice. I’m a gesture. I’m radio talking to you. Listen, listen I cannot hear you. Listen to my radio voice and answer as you like. Some tell you radio is about communication, mass communication. I am radio talking to you, but this is not communication. Some are suffering because of that. They think radio should become communication. They try hard. But in a way they never succeed. I never understood why they want to communicate. Communication could be great, for sure. But not by means of radio. When I want to talk with people, why use the radio where I can only talk to people? Sometimes it is not necessary to communicate. Radio as a means of dissemination does not care about the borderline between art and social life. Considered as an apparatus of distribution, radio intervenes in everyday situations. You might think: radio an intervention in everyday situations? How come? What does this kind of intervention mean? Is it an intervention when I turn on the radio in my car? Or in my kitchen? I suppose, you wouldn’t agree that radio is intervening in your everyday life. I propose a simple test: When you are at home again, wait a moment listening. Listen if your neighbours are at home. Listen to the sound of your fridge. Listen to the distant noises of the streets. Walk through your flat listening. Listen as long as it is necessary to differentiate all the tones that surround you. Then please turn on your radio. Listen to the radio for some time. Listen to the sound of the radio. Walk through your flat and keep listening. Change the frequency after some time. Listen to the noise of the radio. After a minute or so turn the radio off. Listen again. How would you describe the difference? I would say, as I said: radio intervenes in everyday situations. It produces a difference, its sonic waves are changing the space. This reminds me of a text Günter Stern wrote in 1929. Radio is infiltrating spaces with uncanny duplicated voices. Radio is opening a ghostly space. For sure, this dispersed space is nearly forgotten. Nobody cares anymore, nobody is shocked anymore, radio has become part of the normality of everyday life. The ghostly quality of voices is banned with simple means. Most radio programmes are repressing the ghostly quality of radio. Private radio stations play music – music their listeners would like to listen to. They play commercials – most listeners laugh at radio commercials, but they accept them as a necessary part of radio. When you turn on a private radio station at home, your private space is commercialized. You accept that radio is a market place, in which your awareness is sold to companies. You are walking on a market place. The ether became a market place too. Today the shopping streets are turned into a place for the dispersion of radio. My voice cannot be sold. I am not a commodity. I am a constellation. I would like to become an association. Listen to me. Please stop for a moment. Stop going. Please wait for just a moment. Listen to the sound that surrounds you. Please wait another moment and try to listen to what you can't hear. Radio addresses people not as a gathered mass, but as dispersed individuals. Radio listeners are always dispersed all over the city. I don’t know where exact­ ly you are listening to me. A demonstration has a certain power on the street. People are gathering, shouting what they think, what is right or wrong. They stop traffic. You are walking in a pedestrian zone. There are no cars, there are no gatherings. A gathering appropriates public space for a while. A gathering changes public space into a contested political space. Sometimes the banners remind me of commercials. They are advertising another world. A world without commerce, without advertisings. With their banners they are competing with the ads of the commercial world – and they always lose. Why did they lose? I don’t know. There are so many reasons. Perhaps because they only proposed a ‘better fetishism’ instead of getting rid of fetishism. And I have to admit that I think there is no better fetishism than the fetishism of commodities. It is a dispersed fetishism. It is everywhere. It is always there before You are there. The power of a gathering seems always weak compared with the power of the dispersed mass of consumers. Yes, I am talking about you. You do not have to be mobilized. I do not know why you are here. I don’t want to know. I just want to say that you have a great power. On the one hand you have your own aim, but on the other hand the same desire is driving each of you: consuming. I do not know what you want to consume. Perhaps some shoes. Perhaps some images. Perhaps a city called Amsterdam. You always get what you want, don’t you? Your power is the power of all dispersion – it cannot be grasped but it is a force, a driving force. But still, there are desires that are more than an economy of commodities can grasp. The desire of a dispersion, a dissemination that cannot be exchanged. The desire of an endless appropriation, a desire not to turn everything into property. Can you think of different ways of appropriating urban space? What is possible in the space around you? What would you like to do? Don’t answer too fast. I can wait. Hey, what keeps you from appropriating the commodities around you without paying? Why don’t you give something you like to someone you don’t know? I’m talking to you, whether you believe me or not. You shouldn’t believe me, because my voice is not here or there, it is everywhere. You can’t see me. When my voice is audible, you are listening to a strange materialization, as strange as the electromagnetic invisibility of my voice. Perhaps. Perhaps the materialization is even stranger. You hear me, but I am not here. I am everywhere. And I am one, two, three, four, five ... I cannot count how many voices I am. Me, my voice. I am dispersed – my radio voice is not my voice, if you know what I mean. But then – what are you listening to? My voice does not belong to me. My voice is not my private property. But at the same time it belongs to nobody. It can never be property. It is not like the commodities that you buy. But it can become yours as a gift. Even then it is not your voice. It is not private property. It belongs to nobody. Sure, you can tape my voice, you can play it endlessly, you can bootleg this voice. People do these things. But the voice as a radio voice is more than a taped voice, it is a broadcast, dispersed, an electromagnetic voice. It is more than any recorder can record. It is more than a single person can grasp. It is not ONE voice that could be recorded. It is one voice in a plurality of uncountable situations. Radios are broadcasting the voice. The voice is received by a constellation of listeners, an existing but invisible constellation. A constellation of pure coincidence. You are one of the listeners. Raise your eyes for a moment. Take a look around you. Can you see others who are listening as well? Don’t be shy. Maybe you would like to signal to each other? The broadcast is not one constellation, but many constellations. The radio voice only has impact in constellations. Future radio art has to deal with these impacts. The constellation of listeners could be transformed into an association. An association has unpredictable impact. Radio can be something scary. It is a production where you never know what it produces. Something is happening at the same time at different places. I cannot control the impact of my voice. It happens because my voice is dispersed. I do not know how it sounds. It becomes audible. It may sound different in every space where it is received. Sometimes silly, sometimes sad – I cannot control it. I cannot be everywhere where my voice is. I cannot control the effects of the voice. And I don’t want to control its effects. I don’t like its strange sound but I like its uncanny impact. I just want to say something to you, something you might ignore. Consider this: We are living in a society that attempts to control every situation. I am not paranoid, it is not a question of paranoia to see how the control is developing. This society is turning paranoid – thus everyone seems to accept that control is a very normal thing, that it is ok for instance, if in every shop customers are controlled by video surveillance. Please stop at the next shop with a video camera and a monitor in its entrance. Look at the monitor and point at the camera. They are taking a photographic image of you. If you have a camera take a photo of yourself on the screen. Reclaim the image they are taking of you. The fear of the loss of private property is stronger than the desire to act without surveillance. We think that it is safer to be under surveillance. We think that it is nicer when all situations are controlled, don't we? Please stop again and take a look around you. Look who is here and who is not here. There is nobody missing, you might think. Do you see someone sitting on the ground? See any deviant behaviour? Any poor people here? People who don’t have the money to buy the goods available in the shops? I don’t see you, but I know what you are doing. You are walking along Kalverstraat. Sometimes you stop in front of a shop window. You take a look at the goods that are presented there. Commodities from all over the world are brought here. They have been distrib­ uted to these shops. You are distributed like the commodities in the shops. You sell your labour power like a commodity. Some of you still have to learn how to become a commodity. Can you see your image in the shop windows? You are dispersed like my voice. But fortunately enough, my voice is not a commodity. You cannot pay to listen to my voice. My voice can be dispersed but it cannot be exchanged. You can listen to my voice. My voice is in your ear. I am talking only to you. You don’t have to listen. But you have to know, I will follow you. You can ignore me. But you should know that I will still be there sometimes. You believe you are walking down a street in Amsterdam. And you are. Look into the window of the next shop. Clothing? Shoes? Something specific to this city? What is specific to a city? The buildings? The people? The way they talk? Their unheard voices? I am asking you: What is specific to a city? This is not a multiple choice test. You can answer now. I am waiting. Say it. Say it out loud. Now walk on. Observe what is specific to the Kalverstraat in Amsterdam. Take a look at the ground. I am not sure what you see. We are living in a world where communication has become one of the most important issues. The means of communication have been more developed than a lot of other means. Nearly everyone in this street and everyone who is listening to this programme has a mobile phone. There is a desire to communicate every moment, a desire to be understood in a world we don’t understand. I do not want to be understood. But I can be heard. I can only be heard as a distributed voice. I do not care, because I don’t know what happens to my voice. That does not mean it doesn’t matter. On the contrary. Because it matters I do not care. This is the responsibility of my voice broadcast in this programme. It is the responsibility of each single voice that is played on the radio. Each single but the same voice that you can listen to. That – in my opinion – is what communication is about. We cannot understand each other – but it matters in a way you never know. In other words, it is not communication that matters but distribution. Communication nowadays is defined as exchange like exchanging goods. Speech is like a currency. Everything can be exchanged. You can exchange any sentence for any other sentence – it doesn’t matter. I am talking about the future of radio art. But not as talking. The situation of reception matters. Radio is about these situations – uncontrollable situations. Is there good reception today? Since radio intervenes in everyday life, this is the decisive question for a future radio art. I have a question I cannot answer myself. What difference does it make if I am talking or if I’m silent. I repeat: What difference does it make if I am talking or if I’m silent. I do not know what kind of radio you are used to listening to. I suppose you are not used to listening to free radio not to mention radio art. Right now, the ether of Amsterdam is nearly sold out. Some frequencies are still available. I am talking on an event frequency that enabled me to broadcast my voice. I was invited to talk to you on this frequency. There are still some frequencies available. Yes. This is a democratic country. SALTO is a frequency for groups. And there still is pirate radio in the ether. I am talking on a pirate frequency to you. I shouldn’t be here. Listen to radio Patapoe! Listen to radio Vrije Keizer! There is a desire to broadcast without paying money. Radio that cannot be exchanged. Radio that is not a commodity. 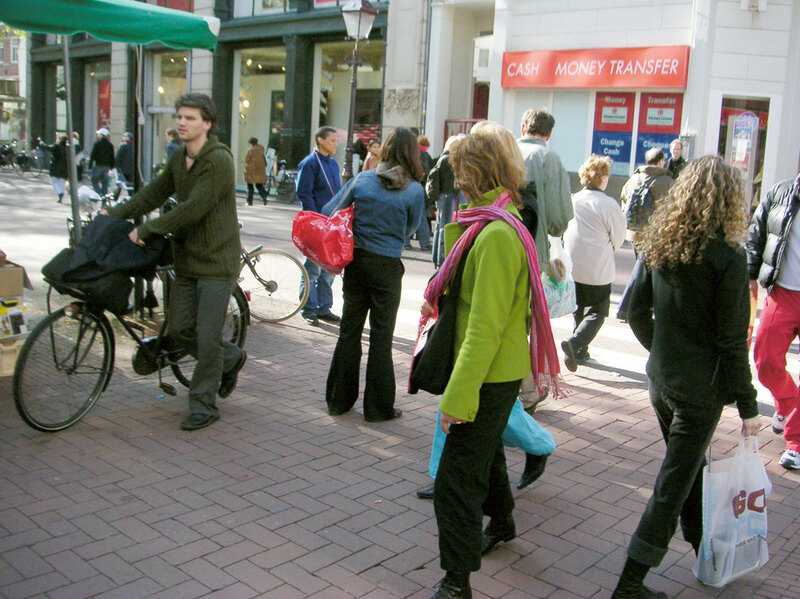 Here, in the streets of Amsterdam, a rich and exciting radio practice took place. An appropriation of the ether for moments that were unforeseen and unpredictable. You will not remember. It is a nearly invisible history of struggles that took place. Most of these struggles were lost in the long run. I am not melancholic, I mention these struggles because they are not over, not past. That you are listening to my voice will become part of these struggles. The ether is sold. This means that the ether is controlled. It has turned into private property. Private property is the best means of control. Private interests defend their property against all who are excluded by the pure fact of this specific property. Thus the world we have to face, the state apparatuses as they are being transformed right now, is a world where everything belongs to someone. Everything is a commodity to be exchanged. Everything but my voice. It belongs to everybody and therefore to nobody. It does not belong to this world. Listen carefully: My voice is an alien voice. It’s why the ether has to be controlled. My voice is here. Here and there. It is possible. But not for long. And only as the future of radio, the future of radio art. Someone has paid so that I can talk to you. As long as I can talk, I ask myself: is an appropriation possible which is not appropriating for instance the ether without turning it into private property? This question is haunting me. You see a world where everything is appropriated by someone: a private person, a company, the state. For me this is a ghastly world, haunted by the fear of loss, exorcizing the materiality of the world, that cannot be owned – voices that cannot be owned – exorcizing the materiality of distribution, dispersion. Obviously there is something that is too much to bear, because it finally cannot be appropriated. No, I am my voice. Don’t listen to the other voices. Listen to me. Only my voice is my voice. You understand? The other voices are frauds. My voice is the only one. Radio blurs the boundaries between the social and the aesthetic. Thus radio art is never pure aesthetics when it is meant for radio. Radio art is always already politicized. Radio art – when broadcast – exceeds the limitations and controls of the art world. It will always find its way into ears that don’t understand it as art. The future of radio art is that of an uncanny medium sans future. For me the future of radio art haunts the presence of the voice. Future radio art takes responsibility for intervening in everyday life. A future appropriation that is never becoming a present property. The utopian promise of radio art lies in the fact that the future of radio will be beyond the control of capitalist economy – it will always be uncontrollable. Excuse me if I repeat myself. I don’t know if I’ve made myself clear. You are listening now to a repetition. Hi, I am talking live. I am talking only to you. Now I am talking to you but it is only a repetition. Not only, but more than one repetition. To be honest, I don’t mind repeating myself. Ole Frahm (Germany) is a member of LIGNA, a German artists’ collective.